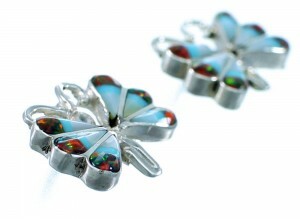 Sterling silver, real Turquoise, Mother of Pearl, and man made Fire Opal. 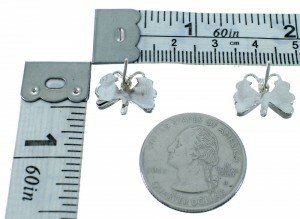 Post stud earrings measure approximately 1/2" long and 5/8" at widest point. This gorgeous pair of earrings are absolutely distinctive in each and every way! This piece of Native American jewelry was Zuni hand crafted by artist Ken Lasiloo, out of genuine sterling silver and real multicolor inlay. The inlay consists of: Turquoise, Mother of Pearl, and man made Fire Opal. The inlay is carefully set, arranged in an extraordinary Butterfly design. 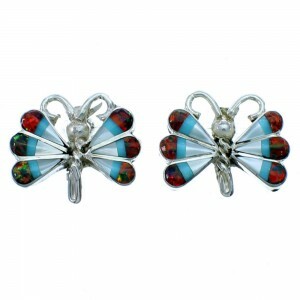 Twisted silver creates the antennas and body to complete the overall beauty of the butterfly.